Wolfgang Buttress is an award winning artist working with public and private space. Author of the UK Pavilion at Expo Milano 2015, Buttress sought to highlight the plight of the honeybee, focussing attention on the importance of pollination in our food chain, by reinterpreting apiarian ecology as an immersive multi-sensory experience. 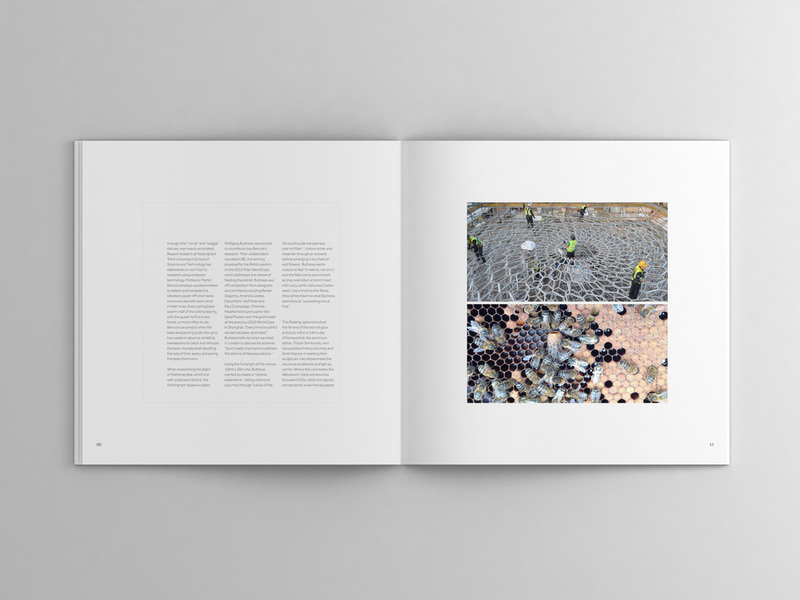 BE HIVE, the book, is a composite anthology documenting the creation of the Pavilion, including sketches, drawings and photos providing context and revealing the story behind it. Content is structured as a sequence of topical essays covering art, science, architecture, engineering and landscape, exploring the synthesis of the disciplines. This limited edition book contains a limited edition artist signed embossed print, a 12" vinyl record and 6 x high quality photographic prints. I have assisted on its creation, from conception to print to everything in between - indexing, archiving, visual research, layout, image retouching, admin, proofing and design. Contributors include Herbert Wright of Blueprint magazine, Christopher Turner, Director of London Design Festival, Paul Smith, fashion designer and Anton Mosimann, caterer at the Pavilion. BE HIVE has awarded 'Best Pavilion Architecture' at Expo Milano 2015.